Caseldine, Chris 2015. So what sort of climate do we want? Thoughts on how to decide what is ‘natural’ climate. The Geographical Journal, Vol. 181, Issue. 4, p. 366. Hecht, Alan D. 2014. Past, Present and Future: Urgency of Dealing with Climate Change. Atmospheric and Climate Sciences, Vol. 04, Issue. 05, p. 779. Tzedakis, P. C. Channell, J. E. T. Hodell, D. A. Kleiven, H. F. and Skinner, L. C. 2012. Determining the natural length of the current interglacial. Nature Geoscience, Vol. 5, Issue. 2, p. 138. Herold, N. Yin, Q.Z. Karami, M.P. and Berger, A. 2012. Modelling the climatic diversity of the warm interglacials. Quaternary Science Reviews, Vol. 56, Issue. , p. 126. Payette, Serge and Gagnon, Réjean 2010. Tree-line dynamics in Ungava peninsula, northern Quebec. Ecography, Vol. 2, Issue. 4, p. 239. Mysak, Lawrence A. 2008. Glacial inceptions: Past and future. Atmosphere-Ocean, Vol. 46, Issue. 3, p. 317. Isla, Federico Ignacio 2008. ENSO-dominated estuaries of Buenos Aires: The interannual transfer of water from Western to Eastern South America. Global and Planetary Change, Vol. 64, Issue. 1-2, p. 69. Cochelin, Anne-Sophie B. Mysak, Lawrence A. and Wang, Zhaomin 2006. Simulation of long-term future climate changes with the green McGill paleoclimate model: the next glacial inception. Climatic Change, Vol. 79, Issue. 3-4, p. 381. Berger, André 2006. Les causes astronomiques des grandes variations du climat au Quaternaire. Comptes Rendus Palevol, Vol. 5, Issue. 1-2, p. 21. McManus, Jerry Oppo, Delia Cullen, James and Healey, Stephanie 2003. Earth's Climate and Orbital Eccentricity: The Marine Isotope Stage 11 Question. Vol. 137, Issue. , p. 69. Magri, Donatella 1995. Some questions on the late-Holocene vegetation of Europe. The Holocene, Vol. 5, Issue. 3, p. 354. Goddess, C. M. Palutikof, J. P. and Davies, T. D. 1990. A first approach to assessing future climate states in the UK over very long timescales: Input to studies of the integrity of radioactive waste repositories. Climatic Change, Vol. 16, Issue. 1, p. 115. SINGH, GURDIP 1988. HISTORY OF ARIDLAND VEGETATION AND CLIMATE: A GLOBAL PERSPECTIVE. Biological Reviews, Vol. 63, Issue. 2, p. 159. Filion, Louise 1984. A relationship between dunes, fire and climate recorded in the Holocene deposits of Quebec. Nature, Vol. 309, Issue. 5968, p. 543. Kerfoot, W. Charles 1981. Long-Term Replacement Cycles in Cladocerans. BioScience, Vol. 31, Issue. 2, p. 139. Woillard, Geneviève 1979. Abrupt end of the last interglacial s.s. in north-east France. Nature, Vol. 281, Issue. 5732, p. 558. Bowen, D.Q. 1979. Geographical perspective on the Quaternary. Progress in Physical Geography, Vol. 3, Issue. 2, p. 167. Woillard, Geneviève M. 1978. Grande Pile Peat Bog: A Continuous Pollen Record for the Last 140,000 Years. Quaternary Research, Vol. 9, Issue. 01, p. 1. SARNTHEIN, MICHAEL 1978. Sand deserts during glacial maximum and climatic optimum. Nature, Vol. 272, Issue. 5648, p. 43. Schechter, Joel 1977. Desertification Processes and the Search for Solutions. Interdisciplinary Science Reviews, Vol. 2, Issue. 1, p. 36. Curry, R.R. 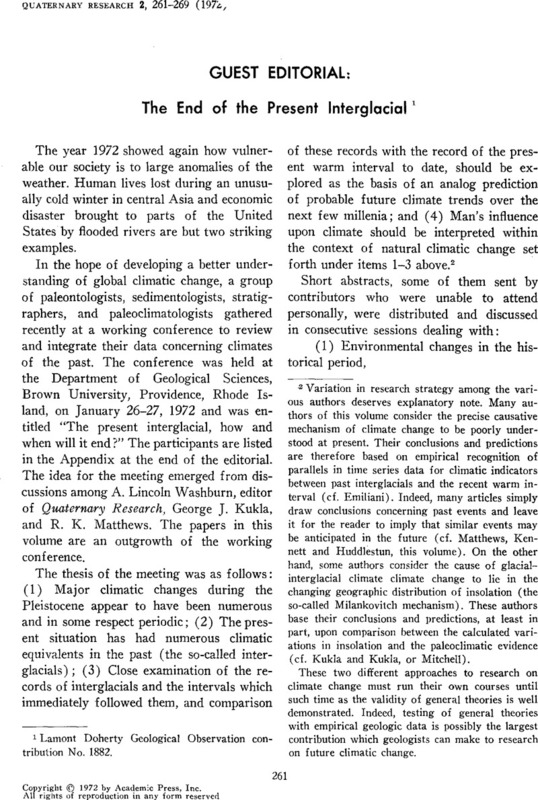 1969 Holocene climatic and glacial history of the Central Sierra Nevada, California Geological Society of America, Special Paper 123 1 47 INQUA Vol.